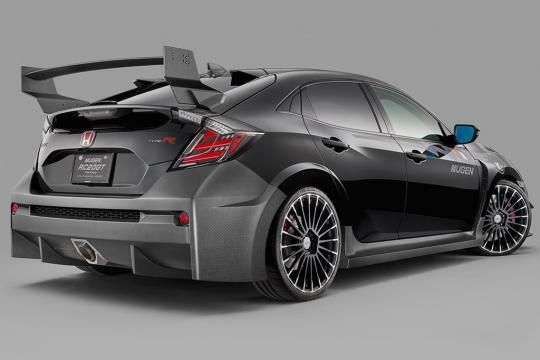 From what we can see, Mugen's RC20GT package for the Civic Type R includes an absolutely wild body kit, a different rear spoiler, a carbon-fiber hood, 21-spoke wheels, and a few graphics on the front doors and fenders. The front end is completely different, with a massive grille opening that features an octagonal insert, and a lower bumper with exactly what the Type R needed—more vents and scoops. A Mugen badge replaces the red "H" logo up front, while that revered logo remains at the rear. Apart from the carbon-fiber rear spoiler—which at least appears to be around the same size as the stock Type R's spoiler—the body kit at the rear also features an aggressive diffuser with a massive single center exhaust. No interior photos are available yet, but it looks to have different seats. We won't know if there are any mechanical changes that we can't see until Mugen releases full details about this car. But the company does make the dubious claim that the visual mods help with aerodynamics and cooling. We're not sure we believe it, considering that Mugen's treatment seems to have messed with many of the stock Type R's functional aerodynamic elements. Mugen does make performance parts, too, though, so it seems likely that it has fitted some of its offerings to this turned-up Civic. We'll learn more about Mugen's take on the Type R as the RC20GT package makes its official debut at the Tokyo auto salon next week. 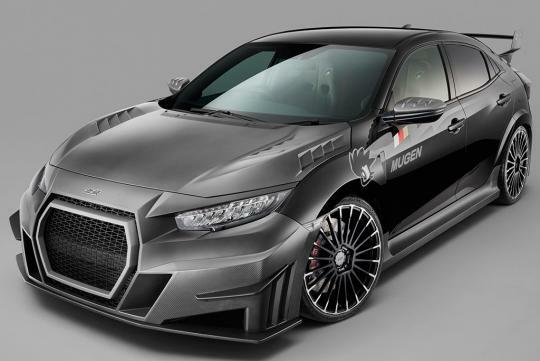 Title should have been "Mugen's Body Kit for the Honda Civic Type R Makes It Look Insanely Horrendous"